Sure, frozen burritos and canned soup are viable single-serving lunch options, but don’t you sometimes miss a homemade mid-day meal? When your body starts craving something fresh and flavorful, whip up one of these super-simple, fresh-tasting, single-serving lunches that are packed with good-for-you ingredients! While it’s easiest to whip this recipe up at home for a quick weekend lunch, don’t be afraid to pack the ingredients and make it in minutes at work. It will only take about as long to prepare as a frozen single-serve pizza. Open up the English muffin into halves. Mix the olive oil, garlic and salt together in a bowl and brush a small amount over the inside of each English muffin half. Place the sliced tomato in the bowl with the remaining olive oil marinade, and toss to cover the tomato slices. Spread the mozzarella cheese evenly on both sides of the English muffin, and top with the slices of tomato. Distribute the Parmesan, feta and dried basil on top of the tomato slices. 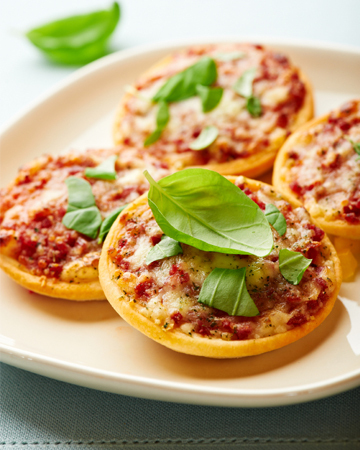 Microwave the English muffin pizzas for one to two minutes, or until the cheese melts. You can double or triple this tuna salad recipe at the beginning of the week and store in your fridge for several days of easy lunches. Mix up a batch of tuna salad using the tuna, mayonnaise and dill pickle relish. You may choose to add salt, pepper or other seasonings as desired. Stuff one half of the sliced and deseeded cucumber with the tuna salad mix. Dice the tomato and onion, topping the tuna salad with the extra veggies as desired. Place a small amount of feta cheese in the other cucumber half. Fit the two halves together like a sandwich and wrap it in plastic wrap to hold it together until you’re ready to eat it. Salads aren’t known for being easily transportable, but when you pack your goodies in a mason jar, it becomes super-simple. As long as you make your salad by placing the dressing at the bottom, filling the jar with your ingredients, waiting to put your greens at the very top, you won’t have to worry about wilted lettuce! Place the ranch dressing at the bottom of the mason jar. Layer the remaining ingredients in the jar, starting with the beans, avocado, tomatoes, onions and cucumber. Finish filling the jar with lettuce or spinach. Cap the jar with its lid, and your salad will be ready to eat whenever you want it.